Culinary Adventures of a Poor Student: Looking After My Boy! Third batch of cupcakes in a week! I was really keen on baking this week, and I kept seeing things that I wanted to bake. 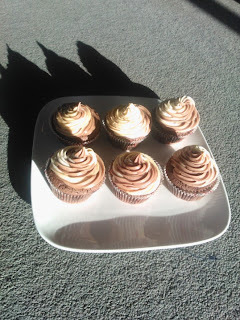 Cue Nutella Cupcakes, stage right. I've always wanted to try doing two-toned frosting but I in fact ended up trying three-toned frosting. Personally, I don't think it needs the vanilla. If you increased the measurements for the other frosting flavours by 1.25 then you would have enough for all of the cupcakes and they'd still look just as great. Still, Cam loved these! Probably not a great move on my part, I left 19 at his house. While he's there alone. Still looking for a job. Hm... I may have to steal a few tomorrow so that he doesn't eat them all... Not that I can blame him, because they were fantastic! They came from Good Life Eats and just wow. Just nutella wow. Make them. PS: Notes on how to do the three/two-toned frosting are at the bottom of this post. NB: You may need a little bit of milk to bring the peanut butter frosting together. Line 2 standard 12 cup muffin tins with cupcake liners or grease using non-stick spray. Preheat oven to 180°C. Sift together flour, cocoa powder, baking soda, baking powder and salt. Set aside. In a large bowl, beat the eggs and sugar for 5 minutes, until it is pale and thick. Add in the butter. Mix until combined. Add in the nutella. Now, add in the buttermilk. Beat until well incorporated. Add the flour mixture in 3 increments and beat until smooth. Divide batter into the cupcake tins. Bake for 20-25 minutes or until a toothpick comes out clean. Do not over-bake. Remove from oven and let cool completely before frosting. Vanilla Frosting:Cream the butter and cream cheese in the large mixing bowl of a stand mixture. Add the vanilla. Slowly incorporate the powdered sugar as you continue to cream. Scrape down the sides of the bowl. Beat on high speed until fluffy and smooth, adding milk or additional sugar (if needed) to reach desired consistency. 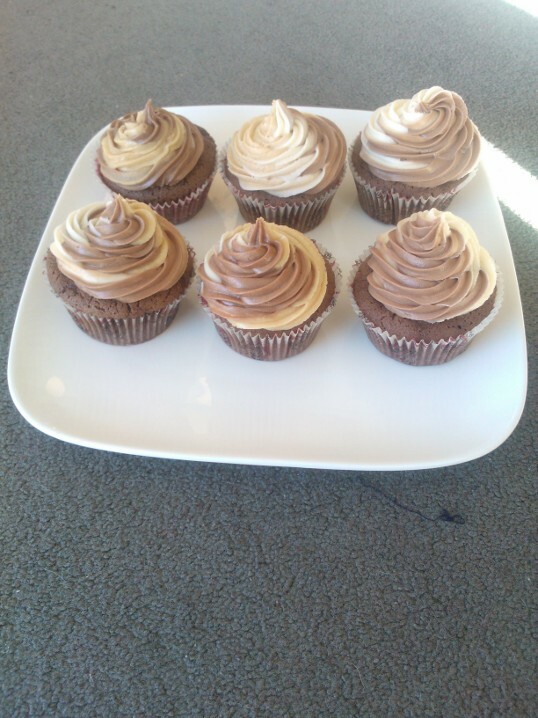 Nutella Frosting:Cream the butter and cream cheese in the large mixing bowl of a stand mixture. Add the nutella and vanilla and continue to cream. Slowly incorporate the powdered sugar as you continue to cream. Scrape down the sides of the bowl. Beat on high speed until fluffy and smooth, adding milk or additional sugar (if needed) to reach desired consistency. Peanut Butter Frosting:Cream the butter and cream cheese in the large mixing bowl of a stand mixture. Add the almond butter or peanut butter and vanilla and continue to cream. Slowly incorporate the powdered sugar as you continue to cream. Scrape down the sides of the bowl. Beat on high speed until fluffy and smooth, adding milk or additional sugar (if needed) to reach desired consistency. Lay your colors or flavors out in different containers to keep them separate. Fill three bags with the three different flavoured frostings. You will not add a tip to any of these bags. Just the bag and the frosting. Twist the tops of the bags and cut about a half inch of the ends of each filled bag. Then, you’ll take a fourth bag. Add your favorite piping tip to the bag. Now, load all three frosting bags inside the fourth bag with the piping tip. Twist the top of the fourth bag so nothing escapes and pipe as usual. I usually do a couple of test pipes on a napkin until all three frostings are evenly coming out and any air has passed.